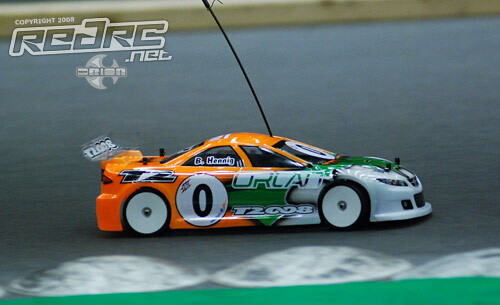 Teemu Leino has taken the first leg of the modified A-main final following a close race with Tamiya racer Viktor Wilck. 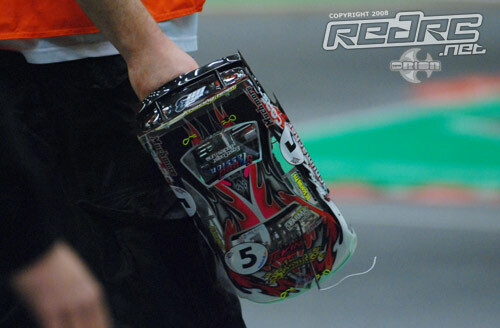 The Team Orion sponsored Xray racer jumped straight into the lead from his pole position and controlled the race, also managing to set the fastest lap of the race, a 15.74 second lap. A race long battle Leino was given some breathing space when Wilck rolled going onto the straight with 30 seconds to go allowing him to finish just over a second in front at the end. Early in the race Groskamp was hit by an extremely fast starting Juho Levanen, this caused his body to tuck under and dropped him to last where he stayed for the rest of the leg. The biggest mover was Ronald Volker, the defending Champion managed to make his way up to 3rd spot at the end, finishing just ahead of 4th place Levanen. In what was a very close race in the stock class it was Jimmy Maddison that has won through from 2nd on the grid to take the win the first leg of the A-main. After a quick start by Jimmy, the pole man Christoph Thiele started to close and then hound the Schumacher racer, eventually getting passed after Jimmy hit the dots going onto the straight. The very next lap Thiele did the same thing and Jimmy got back into the lead which Maddison barely held onto for the rest of the race. On the last lap going onto the straight the pair came together and while Jimmy waited for Thiele Fadkte took advantage of the situation and slipped into 2nd, a half a second behind the winner and 3 tenths ahead of Thiele in 3rd. 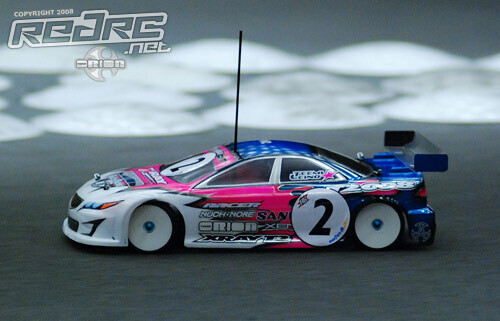 The second round of the stock class saw a great battle in the C-main between Xray drivers Matthias Lang from Germany and local racer Carsten Madsen, who were never more than a second a part for the entire race, the large crowds in attendance being treated to some great racing, commented by Scotty Ernst. Despite trying everything Madsen just couldn’t get passed Lang, and on the last corner before the line the pair touched, Carsten showing great sportsmanship waiting for Lang and the pair crossed the line only 2 tenths apart. In the B-final it was a lot easier for Rasmus T. Callesen, the Corally racer started from 3rd on the grid and managed to get up to 1st place early and lead for the majority of the race. Second placed Ole Strandlyst was never able to get any closer than 2 seconds to the leader and he finished 1 second up on Soren Jeppesen. Round 1 winner Palle Hornum was not able to do any better than 6th, but with 2 of the 3 rounds counting, all is not lost. Todays running sees 2 complete rounds of finals, up to the B, in both modified and stock classes before the first leg of the A-mains are run. 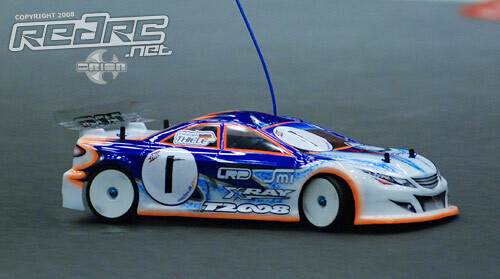 With one round already complete the sub finals have seen lots of top quality racing and world class drivers in action. 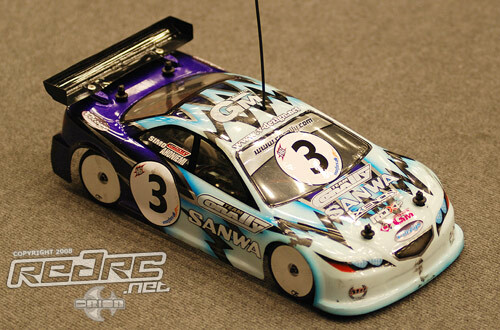 In the modified C-main it was Atsushi Hara from Japan, the former World Champion who had a bad qualifying session, that got it together for the final, setting the fastest lap of the final on his way to a 3 second win ahead of 1/5th scale World Champion Martin Lissau in 2nd. The B-final saw some even tougher competition on track with Simo Ahoniemi being shadowed by Shin Adachi for most of the race, the pair crossing the line only 5 tenths apart with Simo taking the win and Toni Rheinard a further 3 seconds back in 3rd. 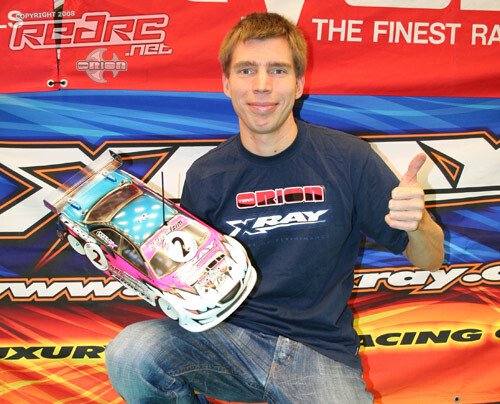 In the stock C final it was Xray driver Carsten Madsen that took a marginal win over second placed team mate Daniel Horn. Starting from the pole position he ended the race only half a second ahead of Horn while 3 seconds further back was Kenneth Malkusson. 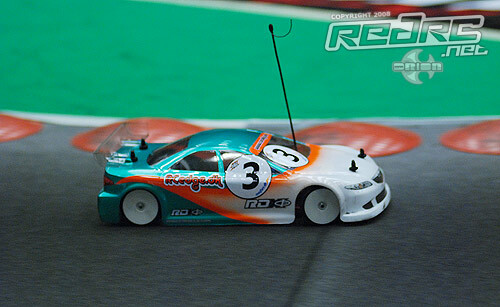 The B-final saw a lights to flag victory for Palle Hornum, the Xray driver from Denmark easily won the race with a 4 second margin from Tamiya racer Dennis Hassing in 2nd, while Ole Strandlyst, also from Denmark, rounded out the top 3. 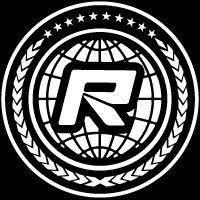 The practice session for the A-main racers in both classes, that is run during the first round of lower finals, has just taken place and there was drama already before the start as front row man Jimmy Maddison had his car collected on the starting grid as a racer failed to slow. The crash took the rear corner off the car but some quick work by his pit crew meant he as able to make the start. Once on the track he was straight on the pace and eventually crossed the finish line first with the fastest lap of the race, a 17.57 second lap, in front of Tommy Bergfelt in 2nd an Dennis Fadtke in 3rd, while on lap times alone, pole man Christoph Thiele was 2nd fastest with Hennig 3rd. In the modified class, it was pole main Teemu Leino who made his intentions clear from the start leading from the grid being followed closely by Viktor Wilck for the first few minutes. Leino eventually traction rolled coming off the infamous bump on the right side of the track, but he had proven his point, turning a 15.66 second lap, 2 tenths quicker than the joint second fastest, Martin Hudy and Andy Moore. Once passed Viktor was able to stretch his lead over Graversen before slowing in the final moments and letting Steen through to cross the line first. Jilles Groskamp used this run to bed in his tires, which are working better after one run on this track, the reason why he couldnt break into the 15 second lap times. In a blistering run that saw him make the fastest qualifying run of the day, a 19 lap run in 5 minutes 03.03, Finland’s Teemu Leino has snatched TQ in round 5 to start from pole position in tomorrows final. In typical Finnish style the Xray/ Team Orion driver showed little emotion but stated he was pleased with his qualifying performance. 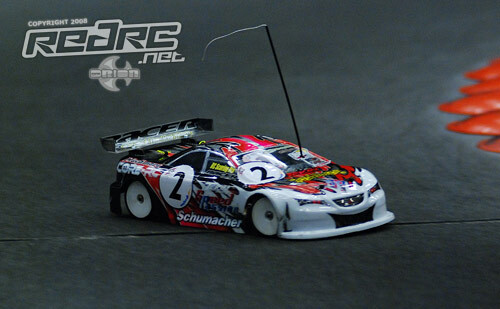 Tamiya racer Viktor Wilck, who had a crash in the final round dropped to 2nd position and in the same incident, the marshall who was attending the crash was hit by Jilles Groskamp who was on pace to take the round win and TQ but instead will start tomorrows final from 4th. Early pole sitter Steen Graversen from Denmark ended the day in 3rd position with 2nd to 4th all covered by the same points. Noticable absentees from the final are Steven Weiss, who will start from pole position in the B finals and Atsushi Hara who ended qualifying all the way down in 24th after a dismal run. Download the final qualifying results for both classes here (PDF). 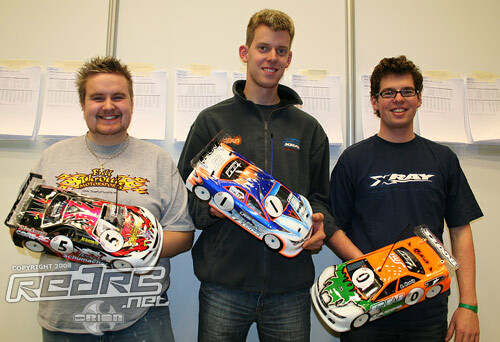 Christoph Thiele put in an amazing run in qualifying, winning 4 of the 5 heats, with his lowest position today being 2nd. “I am very very happy. 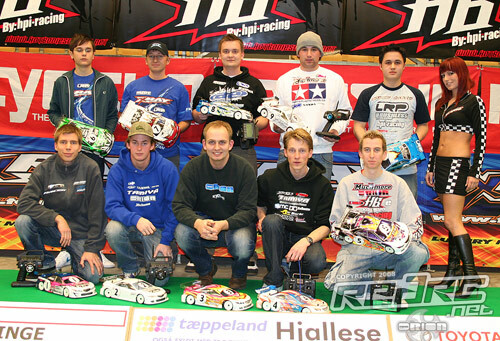 I’m really happy to be here at the DHI Cup, but to be TQ is great. I hope tomorrow I can also do well but for sure Maddison and Hennig will be tough competition in the finals”. Reigning Champion Bastian Hennig from Germany lines up in 3rd spot, just ahead of his Xray team mate Florian Ring.